Herr Prof. Sikora ist im Jahr 2011 zum Ordentlichen Mitglied der Berlin-Brandenburgischen Akademie der Wissenschaften gewählt worden. Nähere Informationen in der Pressemitteilung der BBAW! 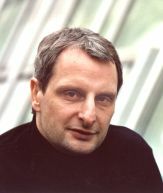 Thomas Sikora is professor and director of the Communication Systems Lab (Nachrichtenübertragung) at Technische Universität Berlin, Germany. He received the Dipl.-Ing. and Dr.-Ing. degrees in electrical engineering from Bremen University, Bremen, Germany, in 1985 and 1989, respectively. In 1990, he joined Siemens Ltd. and Monash University, Melbourne, Australia, as a Project Leader responsible for video compression research activities in the Australian Universal Broadband Video Codec consortium. Between 1994 and 2001, he was the Director of the Interactive Media Department, Heinrich Hertz Institute (HHI) Berlin GmbH, Germany. Dr. Sikora is co-founder of Vis-a-Pix GmbH (www.visapix.com) and imcube media GmbH (www.imcube.com), two Berlin-based start-up companies involved in research and development of audio and video signal processing and compression technology. He is an Appointed Member of the Advisory and Supervisory board of a number of German companies and international research organizations. He frequently works as an industry consultant and patent reviewer on issues related to interactive digital audio and video. Dr. Sikora has been involved in international ITU and ISO standardization activities as well as in several European research activities for more than 15 years. As the Chairman of the ISO-MPEG (Moving Picture Experts Group) video group, he was responsible for the development and standardization of the MPEG-4 and MPEG-7 video algorithms. He also served as the chairman of the European COST 211ter video compression research group. He was appointed as Research Chair for the VISNET and 3DTV European Networks of Excellence. Dr. Sikora is a member of the German Society for Information Technology (ITG) and recipient of the 1996 ITG Award. He received the 1996 engineering Emmy Award of the US National Academy of Television Arts and Sciences (NATAS) as a member of the ISO MPEG-2 video standars group. He has published more than 300 journal and conference papers related to audio and video processing and he is a frequent invited speaker at international conferences. He co-authored three books: "Introduction to MPEG-7: Multimedia Content Description Interface", Wiley 2002, "MPEG-7 Audio and Beyond: Audio Content Indexing and Retrieval", Wiley 2005 and "3D Videocommunication: Algorithms, Concepts and Real-Time Systems in User-Centered Communications", Wiley 2005. He is a past Editor-in-Chief of the IEEE Transactions on Circuits and Systems for Video Technology. From 1998 to 2002, he was an Associate Editor of the IEEE Signal Processing Magazine. He is an Advisory Editor for the EURASIP Signal Processing: Image Communication Journal and was an Associate Editor of the EURASIP Signal Processing Journal.